Situated at an altitude of 2400m, Thimphu is the centre of government, religion and commerce. The capital has an interesting combination of tradition and modernity, and includes some of the most advanced and remotest parts of the kingdom. It is home to the Kings and the Royal family members, civil servants, expatriates, politicians, business persons and monks. Enjoy this cultural mix based on livelihood. Of culture we will take you through dzongs, chortens, museums, handicraft stores, parks and many more. Allow yourself to meet both traditional and contemporary artist. Craft Gallery - The Craft Gallery is a showroom/sales outlet for the products of Bhutanese artisans. The Craft Gallery promotes the marketing and development of all forms of Bhutanese handicrafts. The finest samples of Bhutanese craftsmanship are available for purchase with the assurance of the highest standards of quality and authenticity. The gallery also promotes local artisans, encourages product development and provides guidance to Bhutanese artists to support development of skills. Paper Making Factory - The paper factory uses traditional methods to produce the authentic Bhutanese paper known as Deh-sho. 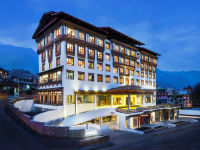 Located 1 km from Thimphu City. The factory uses the bark of two tree species, the Daphne tree and Dhekap tree in the manufacture of traditional paper. Visitors can observe the entire process of producing handmade paper. Dochula Pass- At 3,050 meter, this beautiful pass located on the way to Punakha from Thimphu offers a stunning 360-degree panoramic view of Himalayas mountain range with its 108 chortens that was built by Her Majesty The Queen Mother Ashi Dorji Wangmo Wangchuck. The pass is also a popular spiritual destination for both locals and tourists. Druk Wangyal Chortens - The construction of 108 chortens was commissioned by Her Majesty The Queen Mother Ashi Dorji Wangmo Wangchuck to commemorate the victory over the Indian militants and to liberate the souls of the lives lost. Lhakhang at Paro Droelphug Jangsa was built for remedy of subduing Sadak and Lunyen in the country. The place where Tachong Lhakhang is situated above chhuzom the great Siddha had meditated seven days, and he has the vision that the Lhakhang should be built at that place, and the name of the place is also given by Tachog Gang. Because this particular place is suitable for meditation, and to accomplish ones Buddha’s activities. The natural situation of the place is also in the triangle shape. One day he had seen a woman with the signs of Dakini, and he gave her three blessing pills. Paro Dzong (aka Ringpung Dzong) - Explore the Rinpung Dzong, which the locals call the ‘fortress of a heap of jewels’. Built in 1646 by Zhabdrung Ngawang Namgyal, the dzong stands on a hill above Paro Township. It is linked by the traditional cantilever bridge (called the Nemi Zam) over the Pa Chu where one may pose a photograph. Experience a walk up a stone paved path running alongside the imposing outer walls. Once inside the Dzong, you will be welcomed by themonks, architecture and the ancient frescoes. National Museum (Ta Dzong)- On a ridge immediately above Rinpung Dzong is Ta Dzong, originally built as a watchtower. 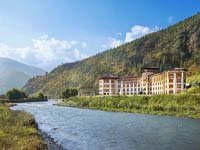 In 1968, Ta Dzong was inaugurated as the first National Museum, and now holds a fascinating collection of art, relics, religious thangka paintings, Bhutan’s exquisite postage stamps, coins and handicrafts, together with a small natural history collection. Start or end your trip with a visit to this marvellous museum. Chele La Pass - Start early for the drive to Chele La Pass, which, at 3, 988m is the highest road pass in Bhutan, snaking upwards through blue pine and rhododendron (Etho Metho) forests for 35 km. On a clear day, the view sweeps away to the snow-dome of Bhutan's second highest peak, Mt. Jomolhari (7, 314m), and down to the Haa Valley, which only opened to foreigners in 2002 due to its promixity to the border with Sikkim and Tibet. Picnic at Chele La Pass - Have a picnic at and have a beautiful short hike at the pass while enjoying the beautiful view. The valley of Haa was only opened to tourists in 2002 and Haa is the least visited valley in Bhutan due to the lack of tourist infrastructure. This has helped keep Haa the way its always been, with Bhutanese families living their traditional and simple life. There are no tourist standard hotels in the Haa valley, so we return to Paro for the night. Lhakhang Nagpo, Black Temple - It's a very peaceful and tranquil place, suitable for meditation. The monastery was established in the 7th century by King Songtsen Gampo in his mission to build 108 monasteries in one day. It is situated towards the north of Lhakhang Karpo. Legend has it that King Songtsen Gampo released a black and white pigeon to select sites to build the temples. 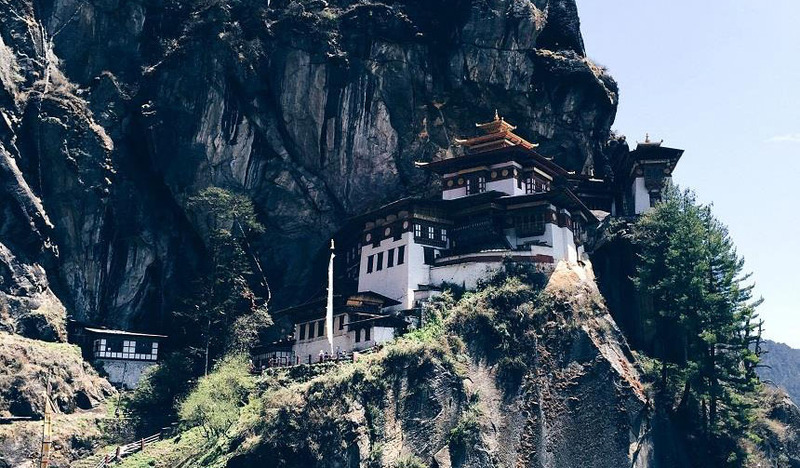 Taktsang Monastery - Often called the Tiger’s Nest, perched on the cliffs, has awestruck many a visitor. “Trip to Bhutan is never complete without climbing to Taktsang”, says one tourist. Indeed, it’s true as the journey there fills you with spiritual bliss. For those not choosing the spiritual side, it is the dramatic, artistically built monument that becomes a hiker’s delight. Take a trip to this dramatically set Buddhist relic hanging from a cliff. Experience the uphill climb as you ascend more than two thousand feet from the valley floor. A prominent Himalayan Buddhist sacred site and temple complex located on the cliff side of Paro Valley. According to legends, it is believed that Guru Rinpoche flew to this location from Tibet on the back of a Tigress (his consort Yeshey Tshogyal) and meditated in one of the caves. Guru Rinpoche performed meditation and emerged in eight manifestations, and the place became holy, thus gaining the name Tiger's Nest.